Hodgkin’s is a malignant disease of the lymphatic system that was characterized in 1832 by the English physician Thomas Hodgkin. The disease is differentiated from other forms of lymphoma by the presence of Reed-Sternberg cells in the areas affected by the cancer. These large, often multinucleate cells were named for German researcher Carl von Sternberg, who described them in detail in 1898, and for American scientist Dorothy Reed, who independently described the cells in 1902. 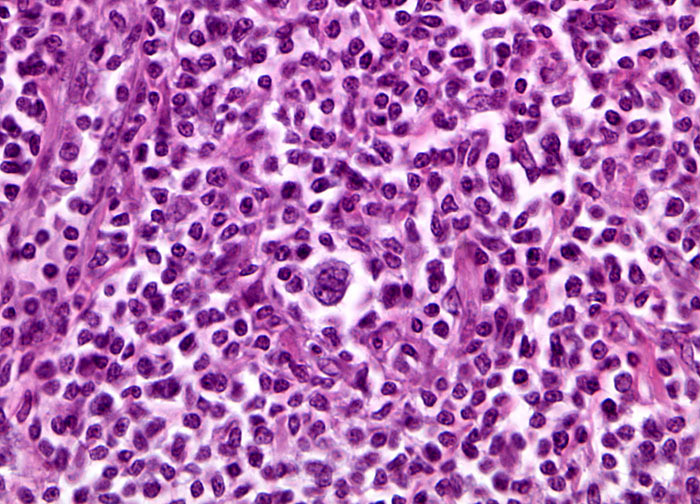 Since the late 1990s, many members of the medical community have come to the conclusion that Reed-Sternberg cells are a malignant form of B lymphocyte, the type of cell that is normally involved in the production of antibodies. The cause of Hodgkin’s disease is not known, but having experienced infectious mononucleosis, an illness caused by the Epstein-Barr virus and spread via saliva, appears to slightly increase the risk of developing this form of lymphoma. Reduced immune system function due to other diseases, such as AIDS, or to immune system–suppressing drugs, often given to recipients of organ transplants, is also considered to place individuals at increased risk for developing Hodgkin's disease.